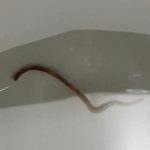 Is Red Worm in Toilet Parasitic? 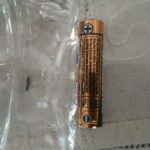 First, we want to applaud our reader for going to the ER. While we do know a lot about worms, we aren’t doctors so we can’t diagnose parasites, and we prefer to leave that to the professionals! That being said, we are fairly confident that this creature is not a parasite. 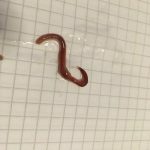 We think it is either a bloodworm or an earthworm. 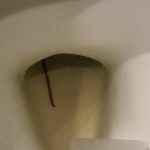 Both earthworms and bloodworms end up in our readers’ toilets all the time! Both specimens can be red-colored, though earthworms are usually more brown or purple. 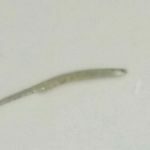 While some species of bloodworms can grow to be 14 inches long, the ones that people find in their bathrooms are usually pretty tiny, sometimes even less than an inch. Earthworms can also grow to be over a foot long, but they usually measure in at a few inches. We aren’t sure about the size of the specimen our reader found. This uncertainty is the main thing stopping us from identifying this specimen as either an earthworm or bloodworm. 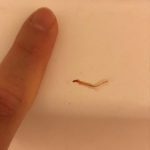 If it is super tiny, then we believe it is a bloodworm. If it is a few inches long, it’s probably an earthworm! As we mentioned, both earthworms and bloodworms are common toilet dwellers. Bloodworms, which are technically midge fly larvae, love polluted water. They feed on organic grime, and if they show up in your toilet it means it’s time for a thorough cleaning! 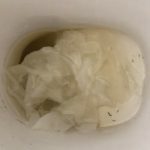 If our reader is dealing with bloodworms, she will most likely continue to discover more until she scrubs out her toilet. She will need to use a cleaning agent targeted at organic material and a pipe cleaning brush. Earthworms don’t live in toilets in the same manner that bloodworms do, but they do end up in toilets from time to time. We believe they get pushed in through the plumbing system occasionally since they live underground near pipes and sewer systems. If this is an earthworm, then our reader hopefully won’t find more of these creatures. If she does, it might indicate that there is an issue with her plumbing system that needs to be checked out by a professional. 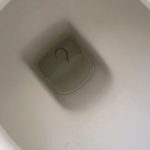 We think she should wait it out but might as well give her toilet a cleaning in the meantime to be on the safe side. 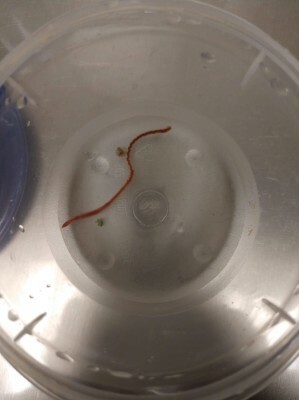 To sum up, we don’t think the red worm our reader found in her toilet is a parasite, rather we believe it is either an earthworm or a bloodworm. Of course, it is good that she went to see a doctor, and she should refer to them for medical advice on the matter! We don't think the red worm our reader found in her toilet is a parasite, rather we believe it is either an earthworm or a bloodworm. Of course, it is good that she went to see a doctor, and she should refer to them for medical advice on the matter! Can Bloodworms Live Inside the Human Body?